Summary: The effects of debt are among the most widely misunderstood factors of macroeconomics. The almost delusional writings of perma-bears and conservatives have demonized debt, while economists often regard high debt levels with complacency. Yet economists have learned much about dynamics of debt. This post looks at this cutting edge of economic theory, very relevant to us today — because the debt supercycle is the story of modern America, and it’s over. First of 2 posts today. — From a speech by Fed Chairman William McChesney Martin Jr., 19 October 1955. This is the effectiveness of debt in America. Can you spot the when the post-WWII economic era ended? The ratio of private sector debt to Gross Domestic Income rose steadily since WWII (after forced deleveraging during the Great Depression and WWII). This was one of the four big growth drivers — along with the increase in US government debt, the population boom (babies + immigration), and rising productivity. This long expansion is the debt supercycle, first identified in the early 1960’s by Hamilton Bolton and Tony Boeckh of Bank Credit Analyst. Here is the BCA’s explanation. It’s the story of modern America. “The Debt Supercycle is a description of the long-term decline in U.S. balance sheet liquidity and rise in indebtedness during the post-WWII period. Economic expansions have always been associated with a build-up of leverage. However, prior to the introduction of automatic stabilizers such as the welfare state and deposit insurance, balance sheet excesses tended to be fully unwound during economic downturns, albeit at the cost of severe declines in activity. “Government policies to smooth out the business cycle were successful in preventing the frequent depressions that plagued the pre-WWII economy, but the downside was that the balance sheet imbalances and financial excesses built up during each expansion phase were never fully unwound. “Periodic “cyclical” corrections to the buildup of debt and illiquidity occurred during recessions, but these were never enough to reverse the long-run trend. Although liquidity was rebuilt during a recession, it did not return to its previous cyclical high. Meanwhile, the liquidity rundown during the next expansion phase established new lows. “These trends led to growing illiquidity, and vulnerability in the financial markets. The greater the degree of illiquidity in the economy, the greater is the threat of deflation. Thus, the bigger that balance sheet excesses become, the more painful the corrective process would be. So, the stakes have become higher in each cycle, putting ever-increasing pressure on the authorities to reflate demand, by whatever means are available. The Supercycle process is driven over time by the building tension between rising underlying deflationary risks in the economy, and the ability of policymakers to create inflation. The rise is best seen in terms of standard credit measures, such as debt to income. 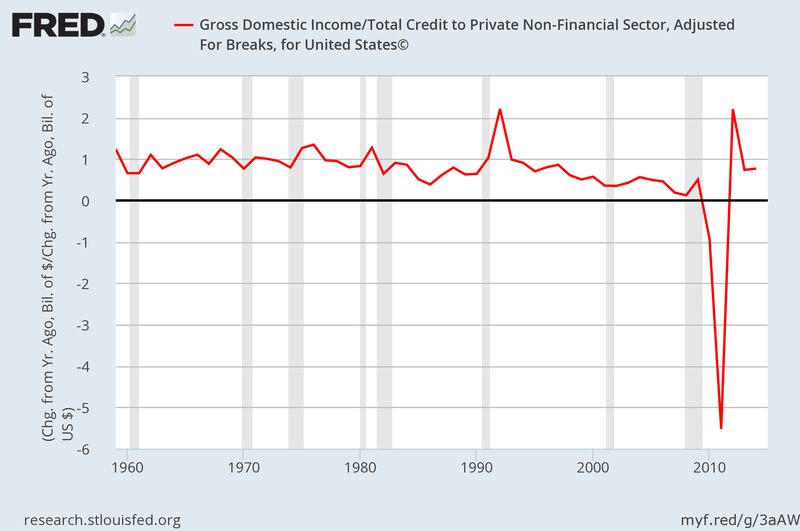 This graph shows the ratio of US private sector debt to national Gross Domestic Income. There were two steep rises: 1984 to 1986 (the Reagan expansion) and a larger rise starting in 1997 — ending in the 2007 crash. The large drop after the Great Recession was the first act of the new era that follows our 50-year-long party. Sometime in the mid-1980’s Maria Fiorini Ramirez, then with Drexel (now one of Wall Street’s top economists) made an insightful observation: over time the effectiveness of new debt was decreasing. That is, new debt provided less stimulus. She speculated that when the economy hit its maximum sustainable debt load then new debt would no longer create growth. That is, the debt elasticity of GDP goes close to zero. At that point the economy must deleverage, marking the end of the post-WWII economic regime in America. This graph shows the ratio of the annual increase in private sector debt over growth in Gross Domestic Income (GDI). As with the above graph, note the breakout in 1997. As above the spike in 2007 marked the end of the post-WWII era. What about debt of the Federal government? America has moderate debt levels. The experience of other developed nations proves that government debt in one’s own currency becomes problematic only at far higher levels than ours — and then usually only during long downturns. What’s wrong with too much private debt? What’s next for America? (a) “Household Debt and Business Cycles Worldwide” by Atif R. Mian, Amir Sufi, and Emil Verne, National Bureau of Economic Research, September 2015. America’s private debt/income ratio has fallen slightly, to its level in 2004 (see the graph). It probably will drop far more during the next generation. Doing so by rapid economic growth seems unlikely (unless the Third Industrial Revolution kicks in soon). The only alternatives are deleveraging through fast defaults or slowly working it down. We might not get to choose. The path taken will help shape the history of the next generation. Death of the post-WWII geopolitical regime, III – death by debt. Rising consumer debt driving the recovery: boon or bane? Insightful as always, FM. I would very much like to see the graph showing debt growth / GDI growth extended beyond 2007 to the current day. It might tell us something about what the future will bring. Great question. See the graph below, with data through end 2015. This post was already too long, so I cut that section. In the early recovery (thru 2010) the economy grew although private sector debt decreased. The debt income ratio fell slightly, back to 2004 levels. Then the marginal effectiveness of debt returned to “normal” levels — albeit with slow growth in private sector debt and slow economic growth. The engine runs, but only in slow gear. My guess is that even this is unsustainable. The two big drivers of household debt are student loans and car loans — both several steps beyond imprudent. Corporate debt has been funding buying stock (mergers and buybacks), not capex — also not sustainable (it is probably ending now). Looking to the future, the Boomers are entering retirement with unprecedented debt loads. I predict bankruptcies during their golden years followed by massive deleveraging — at death. In brief, the new era will be unlike the old — but in ways that we cannot yet predict well. Another aspect of debt is the role played by banks in setting aggregate demand by lending. A growing realization is that banks affect the money supply when they lend. This is not a simple money multiplier fractional reserve ratio requirement argument. The role of banks in affecting the money supply is deeper than that. The key question is who controls our money supply? If the answer is banks, which seems to be the case, then this has profound implications for policy makers. A rich literature on this subject is building right now. Contributors include Werner, Keen, Vague, Hudson, and others. I terms of cutting edge economic theory this is where the action is. Unfortunately this school is becoming aligned with the MMT school out of political expediency in an attempt to achieve critical mass to influence policy. This is a mistake IMO as MMT has too many flaws to ever gain legitimacy. And so it goes. Is a review of the new thinking about banks economic role. Never believe anything you read on Zero Hedge until you verify it. It’s a massive engine of disinformation. They open their article with a falsehood: “Economics professor Richard Werner – the creator of quantitative easing.” He coined the term when proposing the idea for Japan — but did not create the concept, which was used during the 1930s. Also, it is a theory — one of many among macroeconomists, as they attempt to absorb the lessons of the long stagnation in Japan, the global 2008 crash, the recovery, and the 2010 and thereafter events in Europe. Describing it as “the new thinking” misrepresents it. Totally false. The government has total control over bank lending (Congress, Fed, SEC, Comptroller of the Currency, etc). The decisions of bank executives are taken in the context the government creates. Yes the government has ultimate control. The problem is banks can and do lend without worrying about reserves and they rely on stable interest rates at the Fed window. The Fed can reduce bank lending by raising the short rate thus reducing the banks profit spread but if bank lending has been the engine of aggregate demand growth it is very hard to do so. Especially when your top policy advisors are telling you bank debt doesn’t matter since banks merely intermediate between savers and borrowers. Say what you will George Washington does a pretty good job exploding this myth on Zero Hedge. We’ve gone over this before. I’ll repeat my recommendation: read an Econ 101 text, or even Wikipedia. You have a collection of mis-sorted sort-of-correct ideas picked up from reading blogs. Without a firm foundation it results in a series of misunderstandings. Ok. Here’s the thing. When Hyman Minsky proposed his theory of financial stability there were immediate implications that could be tested mathematically. Unfortunately these tests required an ability to correctly cast that math model in terms of stocks and flows per Wynn Godley type sector approach which was co-evolving at that time. Moreover such an approach yields a set of coupled nonlinear ordinary differential equations for the main economic variables, GDP, employment, workers share of output, etc. Incidentally, I was then cutting my teeth on the emerging field of solving these types of equations as part of Chaos theory in Physics. Thus it was a time of great progress in many sub specialties that happened in Minskys time. For me, it was very exciting when Steve Keen put all of this together and first, understood what Minsky was saying, second, correctly modeled the stocks and flows implied, and third, solved the resulting system of non linear equations. I’ll grant you, mine is an unusual perspective that is not easily shared with others. I feel like one trapped in a surreal landscape with a train wreck of lost decades impending. Chicken little like, I try to help by sharing my perspective. So does Keen. The advice I get is to get a new perspective more like everyone else’s. Just as effective as me suggesting you bone up on coupled nonlinear O.D.E and read some Keen. I’d reply, but long experience has taught me that I’d be talking to myself. Rattle on. The Boomers mortgaged our future. Maybe they can reverse mortgage our way out of it? You raise a point which has long bothered me. Our parents were raised in the Great Depression, fought and won WWII, used that victory to create the rule of international law (not perfect, but unprecedented), passed the great civil rights legislation that in effect ended the Civil War (the legal oppression of Black Americans), and went to the moon. We squandered all of those, and ruined much of them — plus wrecking the nation’s finances. Freedom-loving idealists at youth, turned small-minded totalitarian puritans in our old age. The greatest generation’s sorrow were their children. Us. My reading of Reinhardt and Rogoff indicates that the majority of debt cycles they studied were liquidated through monetary inflation rather than through monetary deflation. Either approach may be associated with a real value decline in output and with debt defaults, but they entail some differences in terms of who feels the brunt of the pain. Japan has shown that deflation does not, in and of itself, guarantee the liquidation of the debt cycle. (1) Broadly speaking, there are four ways to resolve excess private sector debt (i.e., when it cannot be paid down): grow out of it, inflation, default, socialization (e.g., govt assumes the debt). Deflation is one factor increasing the odds of default, but the bouts of “jingle mail” (home keys mailed to the bank) in the US show that defaults can occur without deflation. See details here: Debt – the core problem of this financial crisis, which also explains how we got in this mess. Deflation is the opposite of inflation with respect to debt. Inflation makes long-term fixed rate debt diminish in rear value. Deflation makes it increase in real value. So it does not at all produce “liquidation of the debt cycle” unless pushed to the point at which there are large-scale defaults. Is a plot of corporate profits going back to 1900. FM suggested I elaborate on the meaning of this over at seeking alpha but I think it’s better to put it here. The plot shows a remarkable similarity in the shape and flavor (rapid deep decline then rapid rebound) of both the 1921 crisis and our 2007 08 crisis. Data is sparse for the roaring twenties so I’ll start with our recent experience after the GFC. First off I want to say it was a tactical error by Steve Keen in claiming he saw the 08 crisis coming especially his timing same. The GFC was a banking crisis. Specifically banks lost trust in their counter parties and stopped lending to each other which froze the payment system causing a severe drop in corporate profit. This was quickly reversed partly by swift Fed action but also by banks realizing the world was not ending. The sharp dip and equally sharp recovery was IMO thus a psychological phenomenon within the banking system. Nothing in the models proposed by Keen remotely considers banker psychology and it is nonsense for him to say he predicted such an event. Just guessing, the same kind of thing could explain 1921. A few hundred banks (there were 30,000) got into trouble and failed and this could explain a lock up in trust followed by a quick reassessment that panic was unwarranted. I doubt the nascent Fed had much to do with the rebound of 1922. What Keen does predict with his simulations is a second Great Depression. In his model as debt rises demand falls but firms maintain profitability by lowering workers share of output through lay offs and wage reductions just as we are seeing now. Eventually this lowers aggregate demand more which affects firms profit in a death spiral but this takes time to play out. One might speculate this also happened starting in 1921. The layoffs and wage reductions of 1921 would explain the labor strife of the twenties and the delayed drop in demand would explain the death spiral of 1929-33. Honestly I hope I’m wrong because otherwise it’s about to be 1929 again.